(1) The hippocampus is a small infolding of cerebral cortex that is strongly interconnected with the neocortex. (2) The hippocampus lies at the top of the neocortical hierarchy, processing novel sensory information from the world only after the neocortex has failed to recognize that information. (3) During wakefulness, the hippocampus encodes novel sensory information; first, the CA3 autoassociative network learns novel sequences, which can be accessed as working memories, and second, place cells store and recall the novel sequences, which can be accessed as episodic memories. (4) During non-rapid eye movement (NREM) sleep, the hippocampus consolidates novel sensory information by transferring the invariance of newly encoded novel sequences into neocortical memory networks, which can be accessed as semantic memories. (5) By its ability to fully retrieve and manipulate any working, episodic, or semantic memory in the brain, the hippocampus can combine these memories together any way it wants resulting in imaginary mental scenes. The hippocampus is best thought of as the oldest part of the neocortex, though it possesses significant structural differences that make it possibly the most difficult brain structure to understand from a functional perspective. The hippocampus consists of a pair of seahorse-shaped structures lying deep within the temporal lobe. It is actually an infolding of cerebral cortex, which consists of the larger, more recent neocortex plus the smaller, more ancient allocortex; the latter structure contains the hippocampus. However, the hippocampus and neocortex have important structural differences; the hippocampus consists of several three-layered and somewhat structurally distinct subdivisions lacking in minicolumns (Reznikov, 1991) whereas the neocortex consists of numerous six-layered, structurally similar minicolumns arranged into a hierarchy of processing regions (Hawkins, 2004). In 1901, Ramon y Cajal divided the hippocampus into four histologically distinct subdivisions, cornu ammonis (CA) 1-4; cornu ammonis means "horn of Amun", an ancient Egyptian god whose horn the hippocampus resembles. These subdivisions occur in the coronal plane, where the hippocampus has the shape of a curved tube. Each subdivision contains pyramidal neurons similar to those in the neocortex, but the morphology and fiber types differ (Fanselow and Dong, 2010) - CA1 is a large subdivision near the subiculum with small pyramidal neurons that are not extensively interconnected, CA2 is a tiny subdivision with large pyramidal neurons, CA3 is a large subdivision with large pyramidal neurons and an extensive network of CA3 to CA3 connections (Marr, 1971), and CA4 is a small subdivision near the dentate gyrus. Along with the hippocampus proper, the dentate gyrus and subiculum are often classified as part of the hippocampal "formation". The dentate gyrus forms a tightly packed layer of small granule neurons wrapped around the end of the hippocampus proper. The dentate gyrus is the main input region of the hippocampus formation and receives most of its information from the entorhinal cortex, but also from the thalamus, nucleus accumbens, and amygdala, among others. The subiculum lies inferior to the hippocampus proper, near the entorhinal cortex. The subiculum is the main output region of the hippocampus formation, projecting mainly to the entorhinal cortex but also to the thalamus, nucleus accumbens, and amygdala, among others. The entorhinal cortex, a region of neocortex, is part of the hippocampal region, yet it differs from the hippocampus proper in that it consists of six layers (L1-6) of minicolumns like the rest of the neocortex. The entorhinal cortex is reciprocally connected with the hippocampus as well as the perirhinal and parahippocampal cortices of the neocortex and therefore acts as the primary interface region between hippocampus and neocortex (Bird and Burgess, 2008). Three striking features of hippocampal structure should be noted. First, its strongest connections are with the entorhinal cortex. Second, information flows in a unidirectional loop that starts in the entorhinal cortex, passes through a trisynaptic circuit (dentate gyrus to CA3 to CA1 to subiculum), and then returns to the entorhinal cortex. 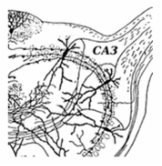 Third, there is an extensive network of recurrent CA3 to CA3 connections. We will discuss the ramifications of these structural features throughout the rest of this chapter. The hippocampus is a seahorse-shaped structure lying deep within the temporal lobe. The hippocampus (circled) of the macaque monkey in the coronal plane; it is in the shape of a curved tube. The largest of the four subdivisions, CA1 and CA3, are labelled. This diagram depicts the relative location of the entorhinal cortex and hippocampus (Bird and Burgess, 2008). The perirhinal and parahippocampal cortices are also nearby. The connections of the hippocampus (Bird and Burgess, 2008); black lines represent neocortical connections and red lines represent subcortical connections. The hippocampus receives information from the entorhinal cortex, which in turn receives information from the perirhinal and parahippocampal cortices. The hippocampus sends information to the entorhinal cortex, which in turn sends information to the perirhinal and parahippocampal cortices. The hippocampus also connects with subcortical structures such as the thalamus and amygdala. This is a sketch of the hippocampus in the coronal plane by Santiago Ramon y Cajal (Ramon y Cajal, 1911). The flow of information is unidirectional, beginning and ending in the entorhinal cortex. From entorhinal cortex L2, information flows from dentate gyrus to CA3 to CA1; information from entorhinal cortex L3 can also be sent straight to CA1. From CA1, information is returned either directly or via the subiculum to the entorhinal cortex. Although the hippocampus shares connections with many different brain structures, its strongest connections are with the entorhinal cortex. This fact carries strong implications regarding hippocampal function. (1) Processing within the neocortical hierarchy. As we saw in chapter three, the neocortex is a six-layered structure arranged into a hierarchy of processing regions with the lowest regions processing raw, basic information representing simple things and the higher regions dealing with more processed information representing more complex things (Hawkins, 2004). We discussed an example involving Clint Eastwood's face to show how the neocortical hierarchy processes visual information, with the primary visual area (V1) recognizing simple lines or arcs at a particular orientation that make up small parts of his face and the inferotemporal cortex (IT) recognizing the entire face regardless of orientation. It is important to recognize that if we are only interested in processing and identifying a part of Clint Eastwood's face, such as the circular tip of his cigar that may be represented by a memory network in V4, there may be no need for processing to go all the way up to IT; the "circle" memory network in V4 correctly predicts the information in the sensory stream, resulting in a good match and recognition of the circular tip of the cigar. 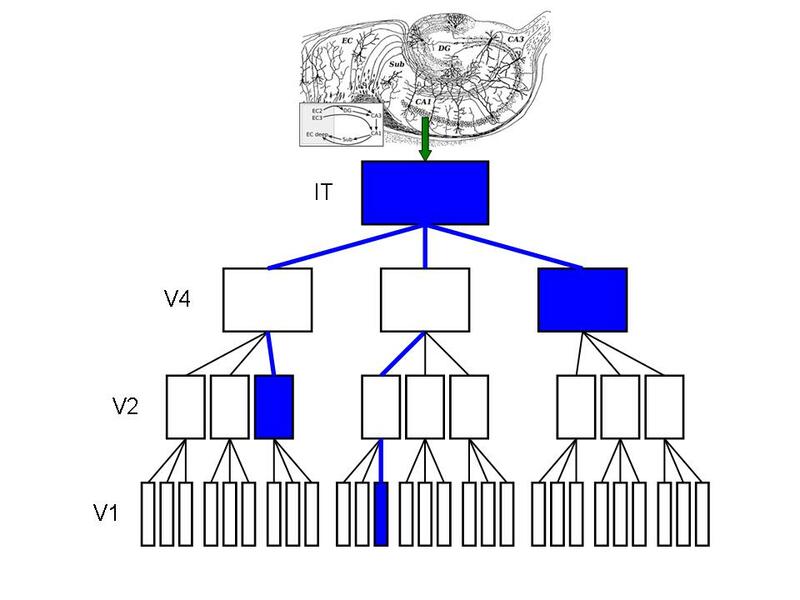 However, if we want to process and identify the entire face, the memory networks in V4 are not up to the task; V4 cannot predict and match all of the information in the sensory stream, so it relays the unrecognized parts to V5, and if V5 cannot predict and match all of the information in the sensory stream, it relays the unrecognized parts to IT. In this way, the sensory stream flows up the hierarchy as far as it has to go until all of it has been matched with memory networks along the various levels of the neocortical hierarchy; at the same time, predictions from the neocortex flow down the hierarchy trying to match past experiences stored in the inventory of neocortical memory networks with the current information carried in that sensory stream. As we know from chapter three, there are many more projections carrying information down the hierarchy than up which implies that predictions from the neocortex form the overwhelming bulk of this "up and down" view of processing in the neocortical hierarchy. The problem posed by this view is that it does not explain how the brain recognizes novel aspects of sensory information, such as a new cafe visited, a new person met, or a new book read; since these things are novel, there are no neocortical memory networks able to match them. Such novel sensory information flows right up the neocortical hierarchy, remaining unrecognized and unmatched even by IT until it gets to the top, which perhaps surprisingly is not neocortex at all - it is the hippocampus. (2) Processing at the top of the neocortical hierarchy. Recall that the hippocampus maintains its strongest connections with the entorhinal cortex, which in turn strongly connects with the perirhinal and parahippocampal cortices, which in turn connect to the rest of the neocortex. The perirhinal cortex is crucial for representing complex objects (Bird and Burgess, 2008) whereas the parahippocampal cortex is crucial for processing geometric information about environmental landmarks (Epstein and Kanwisher, 1998). Since both process complex information, these two cortices must lie near the top of the visual neocortical hierarchy; in fact, the perirhinal and parahippocampal cortices are situated immediately above IT and therefore they probably occupy a similar or even higher level in the neocortical hierarchy. Thus based on structure, the entire visual neocortical hierarchy converges onto the perirhinal and parahippocampal cortices, which in turn converge onto the entorhinal cortex; ultimately, the whole neocortical hierarchy converges onto the hippocampus (Teyler and Rudy, 2007). Being at the top of the neocortical hierarchy, the hippocampus represents the end of the sensory stream processing line, only processing unmatched sensory information after the rest of the neocortex has unsuccessfully tried to match it (Hawkins, 2004); after the hippocampus has processed that information, its unidirectional loop structure returns it to the neocortex. We will now discuss how the hippocampus processes novel sensory information. This diagram shows the structural arrangement of the visual neocortical hierarchy. In the case of vision, V1 recognizes simple lines or arcs at a particular orientation in tiny part of the visual field, whereas IT recognizes complex objects such as faces, regardless of orientation or how much of the visual field they occupy. This extremely simplified diagram shows the functional arrangement of the visual neocortical hierarchy. The sensory stream flows up the hierarchy while neocortical predictions flow down the hierarchy; the neocortex tries to match its predictions with the information in the sensory stream. The bulk of neocortical processing consists of downflowing predictions. 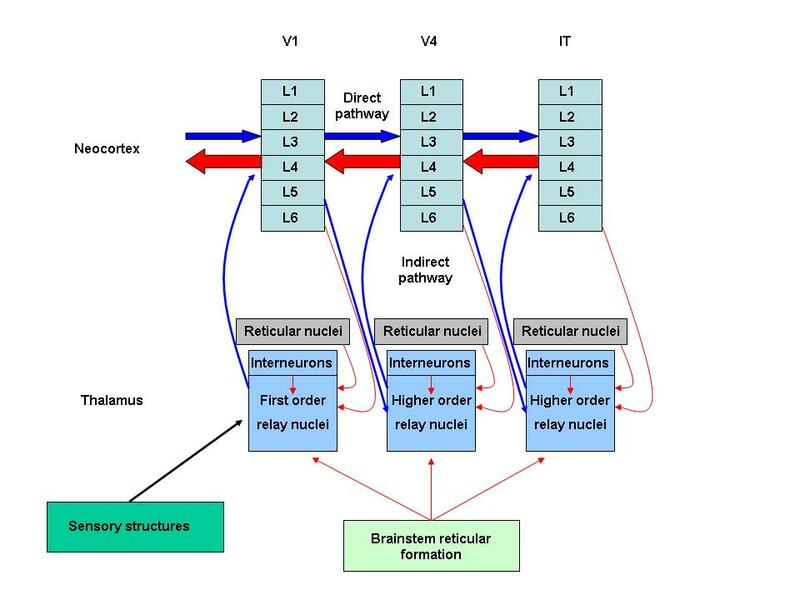 Shown here are specific corticothalamocortical (SCTC) circuits that we discussed in chapter three, which form the indirect pathway so that different neocortical areas can connect with each other indirectly, through the thalamus. The sensory stream is carried by drivers (blue arrows between neocortex and thalamus) while modulators (red arrows between neocortex and thalamus) feed back neocortical predictions. The direct pathway, in contrast, consists of direct white matter connections between different neocortical areas. In both pathways, feedback from neocortical predictions onto the sensory stream constitutes the bulk of brain processing. The neocortical hierarchy converges onto the perirhinal and parahippocampal cortices, which in turn converge onto the entorhinal cortex; ultimately, the entire neocortical hierarchy converges onto the hippocampus. We now speculate on the mechanism by which the hippocampus contributes to information processing. The first step in memory formation occurs during wakefulness and is called encoding (the temporary learning, storage, and recall of novel sensory information). Recall from chapter five that sensory information is interpreted by the brain as a sequence of signals - in encoding, the hippocampus first rapidly learns a novel sequence, then it stores the sequence so that it may be recalled for a short period of time. (1) The nature of novelty. We have mentioned that the hippocampus processes novelty (something completely unfamiliar to the brain), but it is rare that something is ever completely novel - for example, a new house may be new to you, but it still consists of the same familiar structure of rooms, furniture, and smaller items that you know exists in other houses, and a song may be new to you, but it still consists of the same, familiar structure of movements, intervals, and notes that you have heard in other songs; if one looks hard enough, novel things usually possess multiple elements of familiarity buried within their structure. Recall from chapter three that the world has a hidden hierarchical structure (Hawkins, 2004), with most things composed of collections of smaller things, and themselves parts of larger things, and that the neocortex constructs a hierarchical model of this world which it uses to make predictions. When something novel is experienced, it almost always consists of simpler elements that are familiar to the neocortex and stored as sequences by memory networks in the lower levels of the neocortical hierarchy. These simpler, familiar sequences can be used to construct more complex, novel sequences which represent the novel thing in the world. The brain appears to be able to learn novel sensory information almost instantly. We have used visual examples in previous chapters, so we'll look at a few examples involving hearing, though since all sensory information is interpreted by the brain as sequences, the sensory modality does not matter. With hearing, it is possible for you to listen to the melody from a new song for as little as a few seconds, and yet almost instantly recall and produce that tune yourself. This "learning" process is too fast for any of the learning mechanisms discussed so far, including synaptic modification, and must involve a different mechanism, one that is unique to the hippocampus. (a) The CA3 autoassociative network. For several decades, it has been suggested that the extensive CA3 to CA3 connections of the hippocampal CA3 subdivision form an autoassociative network (a group of neurons that uses lots of feedback to feed the output of each neuron back into the input) (Marr, 1971). While autoassociative networks exist in the neocortex, they can also be made artificially using the "neurons" of artificial neural networks (Hawkins, 2004). Artificial neural networks have shown that autoassociative networks display two properties of interest (Hawkins, 2004). The first property of autoassociative networks, as discussed in chapter four, is that they display autoassociation - they can output entire patterns given only partial or distorted inputs - so that partially matched sensory information can be used to retrieve full memories from memory networks in the neocortex. However, the hippocampus does not contain minicolumns or memory networks and so autoassociation in the hippocampus must work slightly differently than it does in the neocortex. The difference relates to the position of the hippocampus at the top of the neocortical hierarchy; from this position, it has access to any neocortical memory network. Indeed, it has been proposed that the hippocampus serves as a neocortical "index" by autoassociating and retrieving neocortical memories given partial sensory cues (Teyler and Rudy, 2007), implying that the hippocampus can retrieve the complete version of any memory stored within the neocortex. The second property of autoassociative networks is that by adding a time delay to the feedback, they can learn sequences (Hawkins, 2004), a fact which is of vital importance since we know that the neocortex not only interprets the world as a sequences of sensory signals, it also stores those sequences in its memory networks so that it can retrieve them and make predictions about them; time delays play a critical role in sequence learning by autoassociative networks. With its ability to retrieve the complete version of any memory stored in the neocortex and by using a time delay, the CA3 autoassociative network almost instantly learns novel sequences by constructing them out of the simpler, familiar sequences that are invariably present whenever a novel thing is encountered. Within seconds of learning them and for the next several minutes, novel sequences may be accessed as working memories (brief, transient memories constructed from the holding and manipulation of multiple pieces of information). (b) The mechanism of novel sequence learning. Given that the hippocampal CA3 subdivision is an autoassociative network and that it can learn novel sequences as working memories, consider the example of hearing a new song; perhaps you have never listened to good music before and hear "Eye Of The Tiger" played over the radio. Since the song is novel, it ascends unmatched through the levels of the neocortical hierarchy up to your hippocampus and into the CA3 autoassociative network. While the song is novel, the individual notes in it are not; you have heard these simpler, familiar elements of the song numerous times before in other songs, just in a different order and played by a different instrument. Thus, the lower levels of your neocortical hierarchy possess memory networks for the notes that make up the novel song, even if you do not contain a higher level memory network that recognizes the song itself. The CA3 autoassociative network retrieves these simpler, familiar memories and constructs a working memory of "Eye Of The Tiger" out of them, and as a result you can hum the melody to the song only seconds after hearing it, even if you have never heard it before. However, this working memory will be forgotten after only a few seconds to minutes if it is not temporarily stored in other parts of the hippocampus. (3) Storing and recalling novel sequences. While learning novel sequences is a process that occurs almost instantly, the sequences are also rapidly forgotten; you have probably experienced this before, where in having an initial thought about something, something else that is related springs to mind, and while you want to come back to the initial thought, your thoughts wander down a tangential path of related thoughts for a minute or two until you realize that you've forgotten the initial thought. This results from the fact that the CA3 autoassociative network can only hold its newly learned sequences briefly, especially if it is made to learn other sequences. To store them for a longer period of time, synaptic modification is required. The hippocampus contains unique neurons called place cells (types of pyramidal neurons that exhibit location-specific activity patterns) (Isaac et al, 2009). Place cells exist in all hippocampal subdivisions and even the entorhinal cortex (Nakazawa et al, 2004). They form within minutes after an animal enters a novel location in an environment, firing action potentials only when an animal enters that specific location (O'Keefe and Dostrovsky, 1971), and are maintained until the environment changes (Nakazawa et al, 2004). Collectively, this allows place cells to store and recall "cognitive maps" of novel locations (Jeffery, 2007). We have mentioned several times now that the world is experienced and learned as sequences of sensory signals, and this applies also to cognitive maps which are learned sequentially, one location at a time; thus, it could be reasonably extrapolated that place cells do not just store and recall cognitive maps, they store and recall novel sequences in general, whether they be visual sequences constructed by seeing novel locations, or auditory sequences constructed by hearing novel songs. Two interesting properties of place cells warrant mention. The first property of place cells is that they rely upon N-methyl-D-aspartate (NMDA) receptors which promote rapid, transient synaptic modification (Isaac et al, 2009), in contrast to the the neocortex which relies more upon voltage-dependent calcium channels which promote slow, stable synaptic modification (Teyler and Rudy, 2007). As result of NMDA-mediated synaptic modification, hippocampal place cells undergo synaptic modification only minutes after they start firing. The second property of place cells is that they are one of the select types of neurons in the brain that may be replaced by new neurons (Bendel et al, 2005). Neurogenesis has been mainly studied in the dentate gyrus, but it also occurs in CA1 (Bendel et al, 2005), a large hippocampal subdivision that is loaded with place cells and receives information from the entorhinal cortex and CA3. With the ability to reproduce place cells, the hippocampus has the ability to create fresh templates required for storing additional novel sequences as they are learned over the lifetime of an individual. Thus, by combining rapid, transient NMDA-mediated synaptic modification with neurogenesis, place cells provide an ideal platform for rapidly storing and recalling potentially limitless numbers of novel sequences learned by the CA3 autoassociative network. Within minutes of learning them and for the next several hours, these novel sequences may be accessed as episodic memories (memories of personally experienced events, dependent upon the place and time of their learning); the situational details in which such memories were learned are retained. (b) The mechanism of novel sequence storing and recalling. Given that hippocampal place cells can store and recall novel sequences learned by the CA3 autoassociative network as episodic memories, consider our song example; yes, it's "Eye of the Tiger" again. If you only listened to the song for a minute or so and never again, chances are that the working memory you formed would be forgotten a few hours later; the song was learned by your CA3 autoassociative network, but since it was not repeated for a certain period of time, it was not stored by your place cells which require at least a few minutes of exposure to novelty before they can undergo synaptic modification. However, if a good friend forces you to listen to "Eye of the Tiger" over and over for twenty minutes, chances are high that you will be able to recall the melody of the song several hours later; the working memory learned by your CA3 autoassociative network is sent over and over in a unidirectional loop to your place cells, the bulk of which are located in CA1. As such, "Eye of the Tiger" has now not only been learned as a working memory, but also stored as an episodic memory which may be recalled over the next few hours to days. It is important to note that since your place cells will undoubtedly be required to form episodic memories of other novel things over the next few hours, the encoded song will eventually be forgotten if it is not transferred into an even more permanent form in the neocortex. If you have never seen this house before, it is novel. Recall that your neocortex, with its neocortical hierarchy, stores a model of the world that mirrors its hierarchical nature. While the house may have a novel appearance, it still consists of the same familiar hierarchical structure of rooms, furniture, and smaller items seen in other houses. Your may know nothing of this particular house, but the simpler elements that constitute the house are familiar to your neocortex and can be used to make predictions about the house. Thus, although you have never seen it before, the house is not entirely novel. Hierarchies are everywhere in the world; a song also has a hierarchical structure consisting of movements, intervals, and notes. It has been suggested for some time that the CA3 subdivision forms an autoassociative network (Marr, 1971) that can autoassociate and retrieve neocortical memories as well as learn sequences. Since the hippocampus lies at the top of the neocortical hierarchy, the CA3 autoassociative network can access or "index" any memory networks it wants; using these simpler, familiar sequences, it can construct more complex novel sequences. Good music is hard to come by. In this experiment, a rat runs around a track while the firing patterns of place cells are recorded from the CA1 subdivision of its hippocampus (Skaggs and McNaughton, 1996). Each small dot indicates where an action potential was recorded, and each different colour indicates when a different place cell fired an action potential. Together, the place cells store and recall cognitive maps of novel locations. There is a large contribution from NMDA receptors to synaptic modification in the hippocampus, unlike the neocortex which relies on voltage-dependent calcium channels. In NMDA-mediated synaptic modification, NMDA receptors are activated by both ligands (such as neurotransmitters) and voltage changes, and require co-activation by glutamate and either D-serine or glycine; voltage-dependent calcium channels, on the other hand, are activated by voltage changes alone. Neurogenesis has been confirmed in the dentate gyrus and probably occurs in the rest of the hippocampus as well, allowing place cells to be regenerated so that fresh templates are always available for storing novel sequences constructed by the CA3 autoassociative network. If you hear "Eye of the Tiger" over and over even for just a few minutes, the novel sequence constructed by the CA3 autoassociative network will be stored by place cells in CA1 and elsewhere such that it may be recalled as an episodic memory hours to days later. After encoding, the second step in memory formation occurs during non-rapid eye movement (NREM) sleep, particularly during slow-wave sleep, and is called consolidation (the transfer of encoded information from the hippocampus into the neocortex) (Rasch and Born, 2013). In consolidation, novel sequences are not only transferred but also transformed as they move into the neocortex where they are permanently stored in memory networks. Things in the world are defined by their essential, unchanging features, not the details. The essence of a car, for example, is defined by the presence of a chassis, an engine, and four wheels, features that are common to all cars; if a thing does not contain these essential, unchanging features, it is by definition not a car. While considerable variability may exist between different types of cars in terms of appearance and performance, these are details and do not change what a car is; the Ferrari 458 and Dodge Charger SRT8 are both cars despite the obvious details in how they look, sound, and feel. This invariance (the essential features of a movement, cognition, or thing that do not change despite the variability that exists between like movements, cognitions, or things) is what neocortical memory networks actually store and retrieve when they store and retrieve their sequences. Invariance is a core feature of neocortical processing, and it allows the neocortex to handle variation in the world (Hawkins, 2004). In our example with Clint Eastwood's face in chapter three, it is how the higher levels of your neocortical hierarchy maintain a constant firing pattern as you approach Clint from the side to stand in front of him; despite the angle change which results in the details of his face constantly changing as you approach him, the invariant sequences stored in the "Clint Eastwood's face" memory network keep firing constantly, allowing your neocortex to handle the variability in his appearance as the angle changes. Invariance is consolidated during NREM sleep. Contrary to popular opinion, dreaming does occur in NREM sleep, although the recall rate is less than 50% compared to over 80% for rapid eye movement (REM) sleep (Nielsen, 2000). NREM dreams are episodic; they consist of realistic, thought-like memories of personal experiences that occurred at a certain place and time (Wamsley and Stickgold, 2011). The dreams consist largely of recent scenes, acquired during the preceding day, which Sigmund Freud called "day residue" (Freud, 1913). Since Freud, many additional studies have confirmed that dreams with strong similarities to recent experiences appear during sleep (Wamsley and Stickgold, 2011), including a powerful influence from the immediate sleep setting itself, which in most studies is the sleep laboratory (Dement et al, 1965). Much of the dream content in NREM dreams therefore appears to be drawn from those novel sequences encoded in the hours before the onset of sleep. The most prominent hippocampal activity during slow-wave sleep consists of neuron bursts called sharp waves (Buzsaki, 1998) which reflect transient activation of CA3 to CA1 pyramidal neurons (Buzsaki et al, 1992; Chrobak and Buzsaki, 1996). It is thought that sharp waves represent reactivated episodic memories being transferred from the hippocampus to the neocortex in NREM sleep (Payne and Nadel, 2004). Thus, while the hippocampus encodes novel sequences during wakefulness, it plays the same sequences back during NREM sleep in a kind of hippocampal replay so that they can be transferred to the neocortex. However, animal studies show that although patterns of hippocampal neural activity during wakefulness and NREM sleep are statistically similar, they are not identical (Wamsley and Stickgold, 2011). During hippocampal replay, recently experienced scenes are reproduced in NREM dreams on a faster time scale and in a fragmented, low fidelity manner compared to the original experiences (Ji and Wilson, 2007; Nadasdy et al, 1999). This implies that novel sequences recently learned and stored by hippocampal place cells are not only transferred to the neocortex for consolidation, but also transformed along the way, a transformation that goes beyond a mere strengthening effect and additionally involves a consolidation of the "gist" or invariance of those sequences by the neocortex (Wamsley and Stickgold, 2011). Upon being consolidated, the invariance of novel sequences may be accessed indefinitely as semantic memories (memories of factual knowledge, independent of the place and time of their learning); the situational details in which such memories were learned are forgotten. A final observation must be made regarding the hippocampus during REM sleep. Most NREM dreams occur early in the night, when cortisol levels are low (Payne and Nadel, 2004). As the night progresses and REM sleep becomes more predominant, cortisol levels rise and inhibit CA1, the main hippocampal output subdivision which also contains an abundance of place cells. This hippocampal inhibition disrupts the flow of information from the hippocampus to the neocortex (Payne and Nadel, 2004) so that neocortical memory networks spontaneously fire away and are converted into movements - though REM atonia prevents spinal motor neurons from executing the movements - and cognitions, resulting in the remotely related and extremely fragmented content of REM dreams. Interestingly, although it often makes no sense, a narrative theme still persists during REM sleep; the neocortex has been shown to confront fragmented information by creating a narrative theme during wakefulness, even if it makes little sense, and it probably does this during REM sleep too (Holden and French, 2002; Jacobs and Nadel, 1998). Hippocampal inhibition therefore allows loosely related neocortical memory networks to be involved in the same dream, free of context with the basal nuclei circumvented as we discussed in chapter four, resulting in the linking of loosely related memory networks so that creative insight may occur (Stickgold and Walker, 2004; Stickgold et al, 1999). Creative insight is presumably useful for creative problem solving; many animal studies have indeed shown that REM sleep deprivation does not affect the ability to perform simple tasks, but it does impair memory formation for complex tasks (Rasch and Born, 2013). This is a Ferrari 458. It is a car. This is a Dodge Charger SRT8. It is also a car, but it differs in appearance and performance compared to the Ferrari 458. There are thousands of different kinds of cars; in fact, every single car in the world is unique in some way. Your brain handles all of the variation by consolidating the invariant features that define the essential features that make a car a car , such as the presence of a chassis, an engine, and four wheels. Variable features such as colour, contours, the sound of the engine, and the feel of the seat are just details. The "Clint Eastwood's face" visual memory network fires when he comes into view. 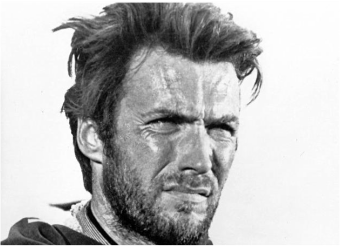 Since they stores the invariant features about Clint's face that do not change despite a change in angle, the "Clint Eastwood's face" IT neurons continue their stable firing pattern. In contrast, since they store nonspecific lines and arcs but are sensitive to changes in orientation, different V1 neurons now fire. NREM dreams are realistic and thought-like, and often contain episodic memories with strong similarities to recent experiences. There is a powerful influence from the immediate sleep setting itself on NREM dream content, which in most cases is the sleep laboratory (Dement et al, 1965). During hippocampal replay in NREM sleep, place cells replay their stored novel sequences back to the neocortex; they are not played out like a videotape but rather in a fragmented manner, with low fidelity, and on a faster time scale than the original experiences (Ji and Wilson, 2007; Nadasdy et al, 1999). Neocortical memory networks are not matched or converted into movements or cognitions. During hippocampal inhibition in REM sleep, high cortisol levels inhibit CA1 and the flow of information from the hippocampus into the neocortex is disrupted. Neocortical memory networks are spontaneously fire away and are converted into movements - though REM atonia normally prevents spinal motor neurons from executing the movements - and cognitions. So far we have discussed how the hippocampus is involved in encoding and consolidating novel sensory information. In wakefulness when novelty is encoded, the CA3 autoassociative network learns novel sequences (by retrieving autoassociated memories from the neocortex and employing a time delay) to construct working memories, and place cells store the novel sequences (using NMDA-mediated synaptic modification and fresh templates from neurogenesis) to construct episodic memories. In NREM sleep when novelty is consolidated, the novel sequences are transferred into neocortical memory networks and transformed (via hippocampal replay) along the way so as to store invariance. Regardless of whether a working memory is learned, an episodic memory recalled, or an episodic memory consolidated during a NREM dream there is the presence of a remembered or imaginary mental scene (a multisensory collage of images, sounds, and other senses) (Bird and Burgess, 2008). When such a scene consists only of visual images, it is often called the "mind's eye". This mental scene is produced as memories stored in the hippocampus or neocortex are recalled or retrieved, a process which probably crucially involves the CA3 autoassociative network since it is involved in all aspects of encoding and consolidation as described above. In constructing a remembered mental scene, which is what we have been discussing this chapter, the sequences involved are based on a current or recent interaction with novel sensory information from the world, whether they be working or episodic memories being constructed during wakefulness, or episodic memories being replayed during NREM sleep. When you hear "Eye of the Tiger" for the first time, for example, several things happen depending upon how long you listen for - within seconds you form a working memory of the song that is faithful to the song itself and that may be recalled for several seconds to minutes, within minutes you form an episodic memory of the song that may be faithfully recalled for the next several hours to days, and if you are exposed to the song for a few hours you might have NREM dreams about it that are somewhat faithful to the original. These are all remembered scenes of "Eye of the Tiger"; they are all based on that song and try to faithfully reproduce it. The hippocampus does not have to faithfully reproduce the memories it learns, stores, and retrieves. Since it can construct working memories, recall stored episodic memories, and retrieve the complete version of any semantic memory from the neocortex, the CA3 autoassociative network can form a mental scene out of any combination of these memories that it desires, as well as transfer such memories to the neocortex. In doing so, it constructs an imaginary mental scene that is not based on a faithful replay of the world as it was experienced, but consists of a manipulation or recombination of memories. In creating a new song, for example, you take bits and pieces from familiar songs and recombine them in novel ways; you may borrow part of "Eye of the Tiger", but you also borrow parts of other songs. The result is an imaginary, novel song, constructed out of bits and pieces of familiar songs, that never existed before. Whenever a working memory is learned, an episodic memory recalled, or an episodic memory consolidated during a NREM dream there is the presence of a remembered or imaginary mental scene. Remembered scenes try to faithfully reproduce actual sensory information, such as a person or the wings of a bird. Imaginary scenes are formed from a recombination of remembered scenes, such as an angel. When you hear this short sequence from "Eye of the Tiger" for the first time, within seconds you form a working memory of the song that is faithful to the song itself and that may be recalled for several seconds to minutes, within minutes you form an episodic memory of the song that may be faithfully recalled for the next several hours to days, and if you are exposed to the song for a few hours you may have NREM dreams about it that are somewhat faithful to the original. These are all remembered scenes of "Eye of the Tiger"; they are all based on that song and try to faithfully reproduce it. In creating a new song, you take bits and pieces from familiar songs and recombine them in novel ways; you may borrow part of "Eye of the Tiger", but you also borrow parts of other songs such as "More Than a Feeling" and "Here I Go Again". The result is an imaginary, novel song, constructed out of bits and pieces of familiar songs, that never existed before (which should sound pretty awesome considering what it was made out of). The hippocampus encodes and consolidates novelty. It works overtime in a child, as the need to learn about novel new things is greater when less is known about the world. It seems to diminish in relative importance in an adult, and it seems to be that the more you "know", the less you remember. Perhaps it is best to never stop seeking novelty. Get ready for the amygdala. Bendel et al. 2005. Reappearance of hippocampal CA1 neurons after ischemia is associated with recovery of learning and memory. Journal of Cerebral Blood Flow and Metabolism 25(12), 1586-1595. Bird and Burgess. 2008. The hippocampus and memory: insights from spatial processing. Nature 9, 182-194. Bruel-Jungerman et al. 2007. Adult hippocampal neurogenesis, synaptic plasticity and memory: facts and hypotheses. Reviews in the Neurosciences 18(2), 93-114. Buzsaki. 1998. Memory consolidation during sleep: a neurophysiological perspective. Journal of Sleep Research 7, 17-23. Buzsaki et al. 1992. High frequency network oscillation in the hippocampus. Science 256, 1025-1027. Chrobak and Buzsaki. 1996. High-frequency oscillations in the output networks of the hippocampal-entorhinal axis of the freely behaving rat. Journal of Neuroscience 16, 3056-3066. Dement et al. 1965. The influence of the laboratory situation on the dreams of the experimental subject. The Journal of Nervous and Mental Disease 140, 119-131. Epstein and Kanwisher. 2008. A cortical representation of the local visual environment. Nature 392, 598-601. Fanselow and Dong. 2010. Are the dorsal and ventral hippocampus functionally distinct structures? Neuron 65, 7-19. Freud. 1913. The Interpretation of Dreams. New York: The Macmillan Company. Hassabis and Maguire. 2007. Deconstructing episodic memory with constructoin. Trends in Cognitive Sciences 11, 299-306. Hawkins. 2004. On Intelligence. Times Books. Holden and French. 2002. Alien abduction experiences: some clues from neuropsychology and neuropsychiatry. Cognitive Neuropsychiatry 7, 163-178. Isaac et al. 2009. Hippocampal place cell firing patternscan induce long-term synaptic plasticity in vitro. Journal of Neuroscience 29(21), 6840-6850. Jacobs and Nadel. 1998. Neurobiology of reconstructed memory. Psychology, Public Policy, and Law 4, 1110-1134. Jeffery. 2007. Integration of the sensory inputs to place cells: what, where, why, and how? Hippocampus 17(9), 775-785. Ji and Wilson. 2007. Coordinated memory replay in the visual cortex and hippocampus during sleep. Nature Neuroscience 10, 100-107. Marr. 1971. Simple memory: a theory for archicortex. Proceedings of the Royal Society of London B: Biological Sciences 262 (23-81). Nadasdy et al. 1999. Replay and time compression of recurring spike sequences in the hippocampus. Journal of Neuroscience 19(21), 9497-9507. Nakazawa et al. 2004. NMDA receptors, place cells and hippocampal spatial memory. Nature Reviews Neuroscience 5, 361-372. O'Keefe and Dostrovsky. 1971. The hippocampus as a spatial map.Preliminary evidence from unit activity in the freely-moving rat. Brain Research 34(1), 171-175. Payne and Nadel. 2004. Sleep, dreams, and memory consolidation: the role of the stress hormone cortisol. Learning and Memory 11, 671-678. Ramon y Cajal. 1911. Histologie du systeme nerveux de l'homme et des vertebres. Paris: A Maloine. Reznikov. 1991. Cell Proliferation and Cytogenesis in the Mouse Hippocampus. Springer-Verlag. Skaggs and McNaughton. 1996. Replay of neuronal firing sequences in rat hippocampus during sleep following spatial experience. Science 271(5257), 1870-1873. Stickgold et al. 1999. Sleep-induced changes in associative memory. Journal of Cognitive Neuroscience 11, 182-193. Stickgold and Walker. 2004. To sleep, perchance to gain creative insight? Trends in Cognitive Sciences 8, 191-192. Teyler and Rudy. 2007. The hippocampal indexing theory and episodic memory: updating the index. Hippocampus 17(12), 1158-1169. Wamsley and Stickgold. 2011. Memory, sleep, and dreaming: experiencing consolidation. Sleep Medicine Clinics 6(1), 97-108.